Given a lucky break, I began teaching yoga right out of teacher training in 2002. I had been a regular student in classes offered by the yoga director of the Soho Crunch gym. 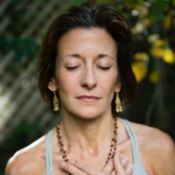 When she learned I had completed my training, she hired me—partly because of our friendship, and partly because the particular training I had done (Anusara yoga with Amy Ippoliti) was so reputable. No audition, no formal interview, no tallying the number of followers I had on Facebook or Instagram. Even Yoga Alliance RYT-200 was cited as optional by both Amy and the gym. I scrambled a resume together and was put on the schedule. As I said, a lucky break. So began my journey into the fabric of the yoga teaching community in NYC. There were only a few superstar teachers back then. They either had been teaching a long time or owned studios, and they were well known simply for their skill and dedication to the practice of yoga. It was the era of the local yoga class, when yoga communities used studios to bring people together through the promise of what yoga holds, regardless of particular school or method. The current emphasis on the celebrity teacher has changed much of that. Global marketing of yoga and yoga-related products has become central to mainstream yoga, usurping the role of the local, intimate community yoga center. The fact that yoga classes are now more widely available online has also affected local studios, since students can now easily stay at home and take a class rather than travel to a studio. For teachers, offering classes online is very appealing and a smart move, providing an additional source of income and the ability to reach a broader audience. Many of the big online yoga studios like Yogaglo and Gaiam are difficult to break into—generally by invitation only, or by recommendation from other teachers in those venues. Do we want to reach masses of people, spreading the word and work through simple inspiration? Or reach practitioners at home, leading them in deep daily practices? One could argue that the celebrity teacher is doing yoga a great service by reaching more practitioners or would-be practitioners, maybe even with the hope that those students will seek out local teachers for regular study and deeper learning. But I have also heard the strong counter-argument that yoga itself can't change the world—that, rather, it’s individuals becoming more awake and more aware who have an effect on their personal worlds and create positive change. Think Local, Act Local. As teachers, we can choose: Do we want to create a more superficial change on a large global scale? Or have a deeper impact at the local, community level? Do we want to reach masses of people, spreading the word and work through simple inspiration? Or reach practitioners at home, leading them in deep daily practices? I approach yoga as a medium for deep personal transformation, and it was through regular classes and an ongoing relationship with a local teacher that my practice developed into a haven for insight, deep listening, and empowerment for creating change. Local teachers are leaders for this kind of change. Often underseen and overlooked, local teachers are those whose classes usually fill through word of mouth, rather than through Instagram marketing or their association with the most popular studio in town. It’s not that they don’t have websites, send newsletters, or promote their classes through social media. But for the local yoga teacher, the drive for popularity doesn't govern the message. They just show up, daily and weekly, to teach their classes and foster community. Our cultural obsession with celebrity fascinates me. It’s present in sports, entertainment, politics, or just about any other profession you can name. The rich and famous in the yoga world mislead the average practitioner about what constitutes and creates a dedicated yoga practice. Often seen smiling at the camera while practicing an inversion or arm balance, yogis on Instagram and Facebook give the message that what they are doing is easy (and for them, it might be). But this imagery projects a contradictory and confusing message, especially when photos of difficult asanas taken in exquisite locations are accompanied by text that alludes to the deeper aspects of yoga, like finding the Divine inside. That’s because for what I’ll call the “average practitioner,” yoga is hard—both externally and internally. It’s dirty work to scrub clean the mental and emotional “gunk” that blocks us from seeing and knowing the divinity of the heart, and these photos confuse the viewer into thinking the pose itself is the pathway to that divinity. And that the path should be easy. And that maybe there’s something wrong with them if it isn’t. The hard work of yoga isn’t visible in the shiny, happy asana pictures or memes-with-mala-beads that dominate our social media feeds. Images there (and in mainstream media, too) of mostly skinny, white, flexible women peddling products in luxurious environments have obfuscated the reality of the practice. These images make it appear as though there were a summit to reach, a finish line to cross, and that the people in the photos have reached it (or are darn close). Have they, like, arrived? No more work to be done? Have they perfected this yoga thing? I loathe that the celebrity obsession has crept into the yoga world. Sometimes it feels as if yoga teachers become famous for everything but their skills in the classroom. But I confess: Though I loathe it, these images pull at me too, and I am conflicted. Sometimes I feel envious of the celebrity teachers who are paid thousands of dollars just for making an appearance, because I too would like to be paid well for the work I do. I’m reminded of what supermodel Linda Evangelista said in the early ‘90s: “We [supermodels] don't get out of bed for less than $10,000 a day.” When and how did yoga turn into a supermodel-type industry? What about the local teachers who are still in their community studios practicing alongside their students, living lives similar to those of their students, and helping to keep the yoga studio business alive? I did not get into teaching yoga to become financially wealthy, and I definitely get out of bed for less than $10,000 a day. Sometimes I get out of bed for way less than $100 a day if a class happens to be small, and I know in some smaller cities and towns the average pay for yoga teachers is much lower than it is in New York. Plus, as do many teachers, I almost always stay after classes to help students or to answer their questions, free of charge. I would like local yoga teachers to be more recognized—not necessarily become famous, but to earn the recognition they deserve for showing up for their students. It’s the local yoga classes that provide the daily or weekly touchstone for students. Local teachers are the ones who are dedicated to helping students create their relationship to yoga, and to themselves. I would like local teachers to be more recognized—not necessarily become famous, but to earn the recognition they deserve for showing up for their students. Recently, I was cited as one of 17 yoga teachers to study with in 2016. It is a big honor to be in such respected company and to be recognized for my work. It was also the first time I had made a list. Do I want students to attend my classes, study with me, enroll in my teacher training, and travel with me to Costa Rica? Well, yes, of course. Will this list help put me on the map? Maybe, a little. Perhaps students who read that article will make their way to my classes, or even register for a retreat. But I know that I make connections to students and draw more from those I see on a regular basis. Connecting with a small local community feels more powerful to me than reaching a thousand people with whom I have never had personal contact. Maybe that's the primary difference between the local yoga teacher and the celebrity teacher: We locals are not invested in spreading the yoga gospel as much as we are invested in those individuals directly in front of us—and how they understand the myriad ways yoga affects their lives. Given all of that, here's my suggestion: Support your local yoga teacher and your local studio. That doesn’t necessarily mean boycotting big festivals and conferences, but you might look closely at their presenter lists. You'll often see they offer the same teachers, city to city, year after year—when there are so many experienced, gifted, inspirational, and insightful teachers living in each of those same cities, infusing true yogic teachings into both their classes and their daily lives. Those teachers need your support. Perhaps we will always see a dichotomy in yoga between the more mainstream, simplistic approach and an embrace of a far more personal and profound yoga. There is room for each, of course, and practitioners will continue to make their choices. But we might look locally for those teachers who plumb yoga's depths and help their students explore that depth themselves—person to person, heart to heart.